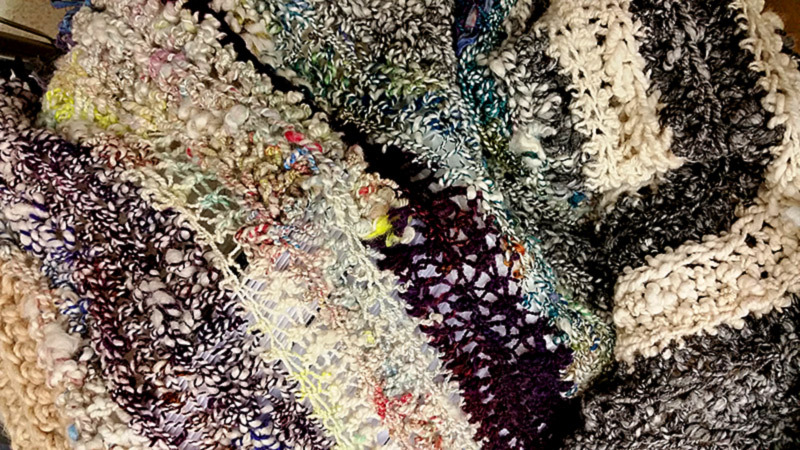 For the second year, the Matthews Art Gallery presents an exhibit into the beauty, art, and skill of modern fiber artists. On her first wedding anniversary Mary LaHood received a cone of cotton yarn from her husband. Five days later, on Christmas morning, he surprised her with her first loom which had traveled by ship with a young woman emigrating from Norway some eighty years earlier. Martha learned to sew by making clothes for her dolls with the neighbor girls. Their mothers sewed so it was a natural thing to do on the plains of South Eastern Montana. She has quilted and learned she was apt at creating her own designs. I have enjoyed working with fabrics and yarns since grammar school and by the time I reached high school, I was skilled enough at sewing to make my own clothes. With funds being limited during the following years, making things for our home and clothes for my daughter and myself became challenging and eventually, very rewarding.